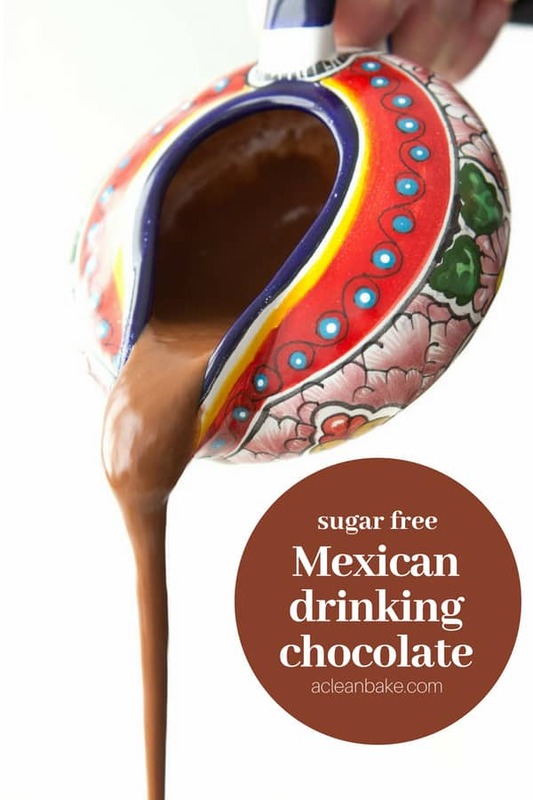 Sugar free Mexican drinking chocolate is thick and silky, deeply chocolatey and just sweet enough! This version is sugar free. 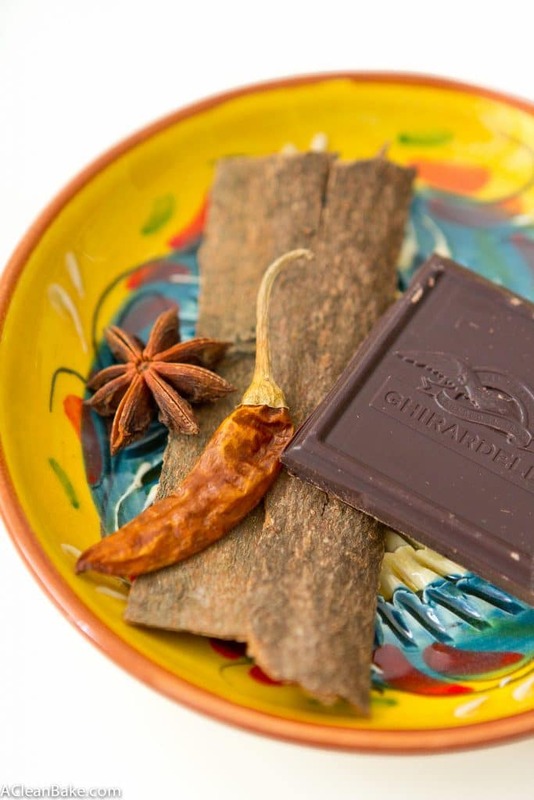 What is Mexican Drinking Chocolate? It’s like hot cocoa’s sultrier, more confident older sibling. 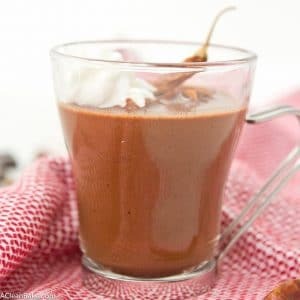 It’s thick and silky, deeply chocolatey and just sweet enough, with an unexpected (but by no means unwelcome) kick that hits in the back of your throat the very instant you’re sure you missed it. 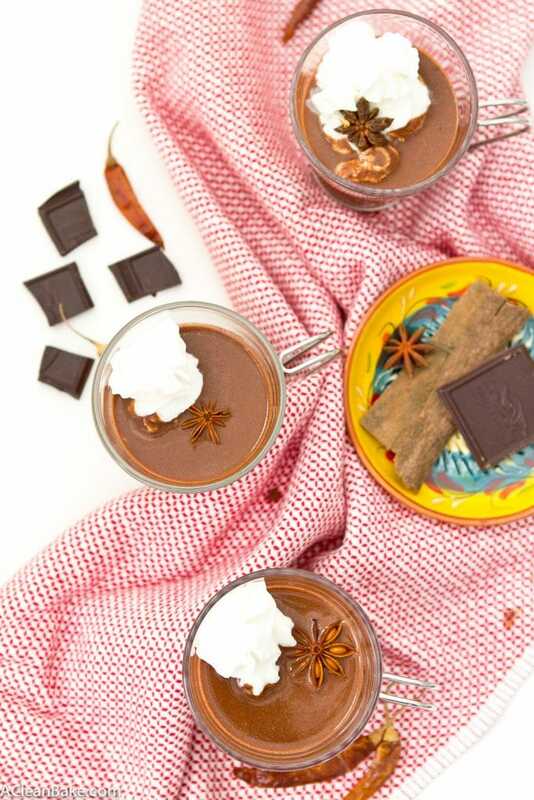 And no, it’s not called drinking chocolate because you should be drinking (alcohol) with it, but since you asked, and it *is* almost the weekend, I wouldn’t think you’re crazy if you added some tequila to your mug. So, now that you know where my head is after this astonishingly long week, hello! And happy Friday! You can always tell what kind of week I’m having by my posting dates. If I’m on the ball and having one of those weeks where I delude myself into feeling like I have everything under control, then the posts go up on Tuesday and Thursday. A challenging week, it’s Wednesday and Friday. A –WEEK– (you know the kind), and there is only one post, if any at all. There you go: Fun Fact Friday! But what was I saying about alcohol? Oh, yes. I need some. I mean: add some to this drink if you want to! But don’t get me wrong. It doesn’t need alcohol. I mean it’s basically one rung down the ladder from just melting a bowl of chocolate chips in the microwave and sticking a straw in it (that’s next week’s recipe) (kidding) (…probably). So, no, you don’t need alcohol. What do you need? Chocolate. The good stuff. Unsweetened (please no Baker’s chocolate. Go big! I used Ghirardelli.). Coconut milk. Full fat, from a can. None of this watery carton nonsense. This is the big leagues. And time, if you have it. Of course, I don’t want to dissuade you from making this and drinking it immediately, but if you can, making it a day ahead and letting it sit in the fridge overnight for the spices to deepen and mingle will really make all the difference. 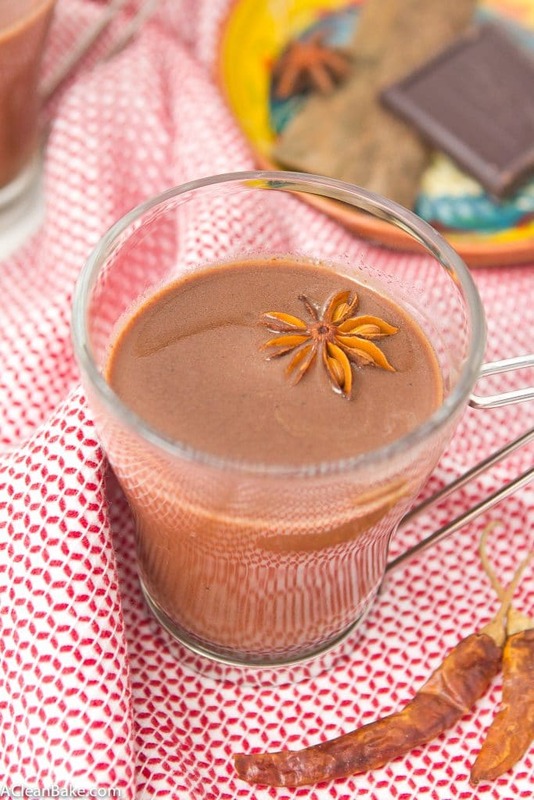 I’ll tell you what: just make a double batch of this decadent Mexican drinking chocolate, so you can have some today AND tomorrow. Problem solved! Combine all of the ingredients in a small saucepan and whisk until the chocolate is melted and the consistency is smooth and silky. Pour into mugs, garnish with whipped cream, and serve OR pour into an airtight container and refrigerate overnight, then reheat before serving. If you can, make this a day ahead and let it sit in the fridge overnight for the spices to deepen and mingle. Reheat on the stove or in the microwave before serving. This post contains affiliate links, which means that if you click through and purchase a product, A Clean Bake receives a small commission, which goes toward continuing to bring you delicious, healthy recipes every week. This does not affect the price you pay. Thanks for supporting A Clean Bake! 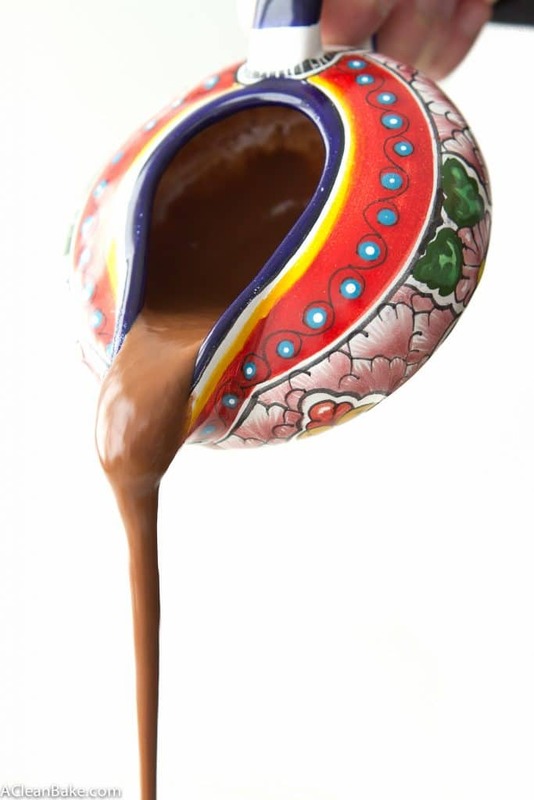 I bet this drinking chocolate is rich in flavor, creamy and super thick! Wayyyy better than Starbucks! Ohhhh momma it’s sooooo thick and decadent looking! 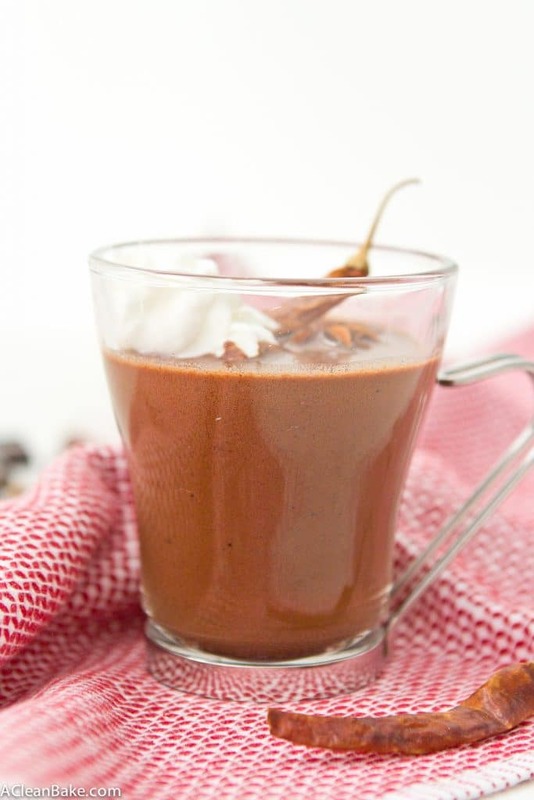 I could seriously drink this every day..I’m obsessed with hot chocolate in any form, and that chili kick is always welcome in my book. Lovely recipe! Ooooooh my goodness. I definitely need this in my life! I’ve never tried, but it should work! Use cream + whole milk in whatever combination you prefer. Using only cream would be very, very rich – I wouldn’t recommend it. Can I leave out the stevia? Trying to eat and drink clean. I feel great, it has not been too hard, but am missing chocolate. You can but it will be very bitter! I wouldn’t recommend it. Thanks for the recipe. The amounts of sweetener you recommend are for xylitol mixed with monkfruit or stevia which would be good to acknowledge for anyone not familiar with them vs pure monkfruit or stevia which would require radically less, maybe 1/2 teaspoon tops. Thanks Marty. That’s what’s implied by “granulated” – since, to my knowledge, there is no such thing as granulated pure monk fruit or stevia. Liquid (pure) sweeteners would, as you say, be required in far less quantities.